A textured brush can be either antialiased or not antialiased. Without antialiasing, your brush strokes will only create fully opaque artwork. 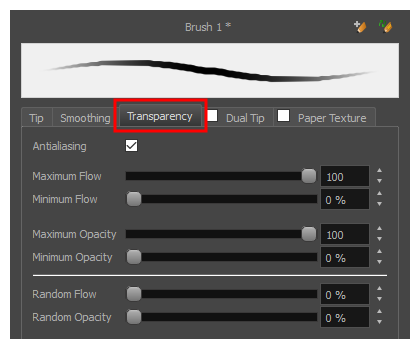 With antialiasing enabled, you also have the option to set the flow and opacity of your brush, allowing you to simulate the effect of inks and paints with various consistencies. NOTE If you are working on a vector layer, make sure the Brush Type option in the Tip tab is set to Textured Vector Brush to enable the textured brush options. In the Brush Properties dialog, open the Transparency tab. If you want your brush to have antialiasing or transparency, enable the Antialiasing option. NOTE If the Antialiasing option is disabled, all Transparency settings will be disabled, and your brush will only create fully opaque artwork. Use the Maximum Flow slider to set the consistency of your brush strokes. A lower flow will make your stroke more transparent towards the extremities and more opaque in its center, whereas a higher flow will make your stroke consistently opaque. If you are using a pressure-sensitive pen tablet, use the Minimum Flow slider to set the percentage of the maximum flow that you want your brush to use when using your pen with very little pressure. If you don't want the pressure on your pen to affect the flow, set this parameter to 100%. Use the Maximum Opacity slider to set the maximum opacity of your brush strokes. If you are using a pressure-sensitive pen tablet, use the Minimum Opacity slider to set the percentage of the maximum opacity that you want your brush to use when using your pen with very little pressure. If you don't want the pressure on your pen to affect the opacity, set this parameter to 100%. If you want the Flow of your brush to be randomized, set the Random Flow setting to any value over 0 %. If you want the Opacity of your brush to be randomized, set the Random Opacity setting to any value over 0 %.